This manure/cover crop newsletter provides some data/photos from area producers. Manure can serve as a cost-effective fertilizer source for crops. It can also create headaches depending on weather, storage capabilities, management, and the number of acres available for spreading. Getting the most value out of manure can be difficult, especially with the potential for nitrification and leaching. Pairing manure and cover crops may be one way to address some of these issues. Cover crop and manure are mutually beneficial. The cover crop captures and recycles the manure nutrients to the following crop and reduces the potential for leaching loss. Manure nutrients aid in the decomposition of the cover crop residue which speeds up the release of nitrogen to the corn crop. This can help synchronize the nitrogen availability with the corn uptake. There are different ways to utilize cover crops with manure. 1) Plant the cover crop into a standing crop (such as through aerial application) or on silage ground and then knife in manure. 2) Slurry seed – mix the cover crop seed in the manure tank and then apply with a low-disturbance tillage tool. 4) Spread composted beef manure on growing cover crop – requires even/thin spread so that the cover crop doesn’t get smothered. 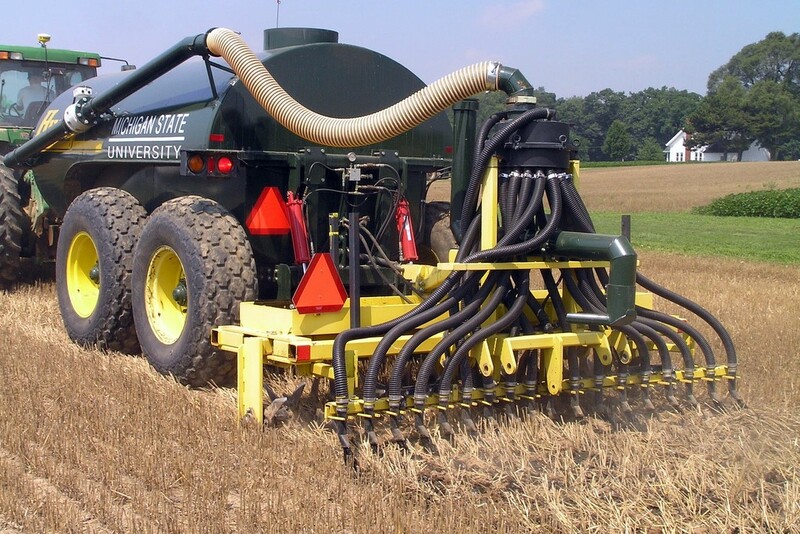 The slurry seeding process was developed at Michigan State University. The biggest benefit to this method is that it allows the producer to limit the number of field passes because the manure application and cover crop seeding are done in a single pass. This results in time and fuel savings. It also builds soil quality by reducing tillage intensity and adding organic matter. Slurry seeding works well after corn silage, seed corn, or early maturity soybeans. It works best on fairly level ground as the seed may not be spread evenly when going up or down hills. If the manure is continuously agitated, this may not be an issue. The Allamakee SWCD worked with Ross and Dave Weymiller to establish demonstration sites last fall (September 2017) and will have a field day this spring (April). Check back for information on the date. We plan to work with a producer (or a few producers) to set up demonstration site(s) this fall (2018) as well to showcase different methods for manure application with cover crop seeding. Keep and eye on the Allamakee SWCD website and the Waukon Standard for more information. Contact the office if you would be interested in working with us. Several local producers were interviewed by NRCS for an article that was recently published in Wallaces Farmer. Click here to read the article and learn more about their application methods and lessons learned.